What is wrong with my dog? Why does he have episodes of snorting and gagging? These comments describe what is commonly called "Reverse Sneezing". Reverse sneezing is when the pet is pulling air rapidly in vs. a regular sneeze when air is pushed out through the nose. It is not know exactly why these episodes occur, but it thought to be an irritation of the soft palate, which results in a spasm. It could be caused from many factors including: eating or drinking, exercise, allergies, post-nasal drip, and irritating chemicals (cleaners, air fresheners, perfumes). 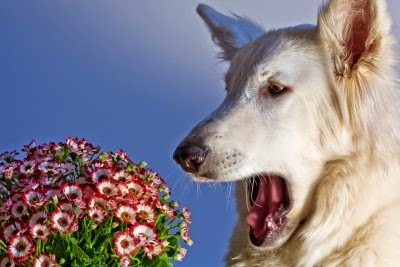 A reverse sneezing episode can be scary and last for several seconds, and may make the owner think they are choking or having an asthma attack, but is not usually considered harmful. However, if your pet has frequent episodes, it is a good idea to visit your vet to rule out other causes (collapsing trachea, nasal tumors or polyps, foreign bodies in the nasal passages or mouth). To help halt the episode, try massaging your pet's throat to stop the spasm or covering your pet’s nostrils very briefly. If your pet has other signs of allergies (scratching, licking, chewing at the paws, etc), then post-nasal drip may be the culprit. Using K9 Yeast Defense and Power Probiotic along with AllerEaze can help. Yeast is often a contributor to skin problems, ear infections and genital licking. Yeast congregates in moist areas such as the throat and mucous membranes. Diets high in carbohydrates such as grains and starchy foods can contribute to yeast overgrowth.